In 1975, John Bogle launched the first ever passive fund, Vanguard 500 Index Fund, and heralded an era of passive investing. Bogle was influenced by Eugene Fama’s view that the capital market was informationally efficient and that sustained success in stock picking was impossible. Since then, trading has increased; more and better investment research is being undertaken; high-speed communication networks have taken away the advantages to a privileged few; and most importantly, institutional investors dominate the markets. In this environment, it is not easy to pick stocks or enter and exit the market successfully and consistently. The torchbearer for passive investing today is the exchange-traded fund (ETF). In the US, during FY 2003-16, total net assets of equity index funds increased by 3.5 times (from $0.39 trillion to $1.77 trillion), while that of active equity funds increased by just 0.7 times (from $2.73 trillion to $4.65 trillion). More importantly, during this period, a net amount of $1.29 trillion moved out of active equity funds while $0.46 trillion moved into index equity funds. Why is passive investing gaining over active investing? It’s because active investing has not been able to deliver returns (net of costs) that are more than from passive investing. Passive funds posted an expense ratio of 0.09% in 2016 while active equity funds were seven times more expensive with an expense ratio of 0.63%. The FT reports that over a period of 10 years, 83% of active funds in the US underperform their benchmark, with 40% funds terminating before 10 years. This global trend prompted us to examine the India story. 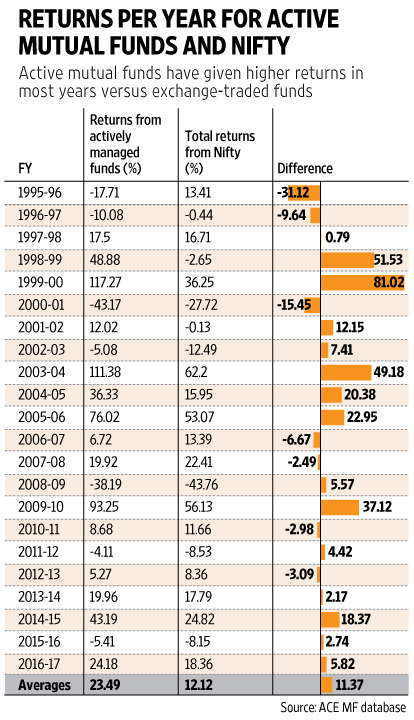 Since 1992, Indian stock markets have seen many developments. Trading has increased; there are more institutional investors; regulations have improved; transactions have become faster; settlements have become shorter; number of analysts covering the market has increased; communication networks are good. We should expect active funds to struggle to beat the market, right? You could not be more mistaken. We examined the returns and expense ratios of 448 actively managed mutual fund schemes from the period of FY 1996 till FY 2017, a total period of 21 years. We used their net asset values (NAVs) to compute the returns from holding these schemes for each financial year. Remember that the NAVs of mutual fund are published after deducting all the costs incurred in running the scheme. In most of the years, when the market booms the active funds beat the index (such as Nifty) by a wide margin. When the market is bearish, their performance is mixed. In some bearish years, they beat the index, but often they lose much more than the index. On an average, the gross returns by active funds exceed returns from Nifty total returns index by more than 11%. Remember that this outperformance is after accounting for the costs of managing an active fund. What about the costs of managing a mutual fund? The expense ratio for active funds from FY 2008 to FY 2017 averaged 2.32% per annum and for ETFs it was 0.61%, leading to a difference just greater than 1.7%. On an average, in India the extra returns provided by actively managed mutual funds have been much higher than the extra cost charged for delivering the return. This is in contrast to the data from the US. Even in the halcyon 1960s, active funds in the US beat the market only by about 3%. What are the possible reasons for this outperformance? Some market experts argue that several quality stocks are not part of the index and hence index funds or ETFs cannot invest in them. Some note that the evolving nature of the market is not reflected in the index. It may also be possible that the relatively smaller size of the mutual fund industry in India could be helping active fund managers get such high returns. In India, the mutual fund industry has only 13% of market capitalization as compared to 95% in the US. It is possible that in the past, mutual fund managers had better information available. If either of the reasons turn out to be true, we might find that, in the future, the actively managed mutual funds do not outperform the market by such large margins. So, should Indian investors invest their savings in actively managed mutual funds? Irrespective of what the data says, the answer is not so simple. Here we have only considered the average returns of all actively managed mutual funds. A retail investor who is likely to invest only in a limited set of schemes would be concerned about choosing those schemes that give better returns in the future. This analysis has not considered the risks taken by the mutual funds to get returns. A fund can easily beat the market by taking more risks. We need to compute the risk-adjusted returns to answer this question. On doing that, we may understand how the active funds in India generate such high returns compared to the market index. Is it a story of great fund management skills? Or is it inefficiency of the market? Or is it a case of taking high risks? Investors and the regulator have a responsibility to understand this.